Ahhh, the pig. What's not to love? And what's not exciting about the prospect of making your own bacon? Here's the tale of my experiment in makin' bacon. When I was in Denver last week, we went to Savory Spice Shop, a local spice store. They had curing salt, also known as pink salt, which essentially is sodium nitrate, a natural preservative used for meat curing. (Celery is high in SN, and many natural hot dog & sausage makers will use straight up celery juice in their "curing" process... I think Applegate Farms is one.) I knew that I could buy SN online or at someplace local like Callahan's, but would probably have to buy a larger quantity than I would ever use in this lifetime. I was able to get 4 oz for about $2.....and I bought some extremely dark cocoa powder (smells like Oreos! ), but we'll save that for another time! The day after I got back, I went to Whole Foods for groceries, and while getting ground lamb for meatballs, I asked the butcher if they had any pork belly. He checked in the back, and lo and behold, he did! I asked for a pound, and asked if he had ever cured it before. He said he had cured other things, but not pork belly; he said you have to have a really sterile environment, and he has a separate fridge that he only uses for curing things. So I was slightly intimidated, but figured at only a pound of pork belly, I wasn't loosing much monetarily if I screwed this up. Furthermore, he looked high and low in all of his books, but couldn't find the proper code for pork belly, so he charged me only $1.99/lb..... I think the total was $2.14 for the little belly! So got home and started Googling pork belly --> bacon recipes.... found out that for bacon, you really don't need the pink salt, as it was primarily used in the olden days to prevent botulism. I guess since the belly is cured, smoked, and then cooked in a skillet/oven, any chances of botulism are negated. However, if you're making various salumis, yes, use the sodium nitrate. 1/2 tsp. 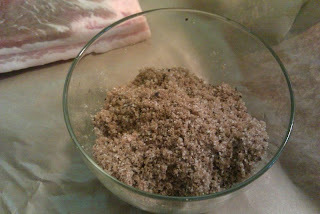 ground coriander ...and then proceeded to slather all sides of the belly, and pop it into a ziplock bag. And into the fridge for the next 2 1/2 days! Turn the bag every 12ish hours or so to evenly distribute the seasonings and extruded juices. This also gave me time to ponder on how to smoke it. I don't own a smoker. I could have rigged one up with my gas grill or some other Alton Brown-esque method, but ultimately decided to go with a borrowed Cameron Smoker and some applewood chips. (I debated between applewood & hickory, but applewood came out on top.) If you're not familiar with Cameron Smokers, they're great home-kitchen devices! 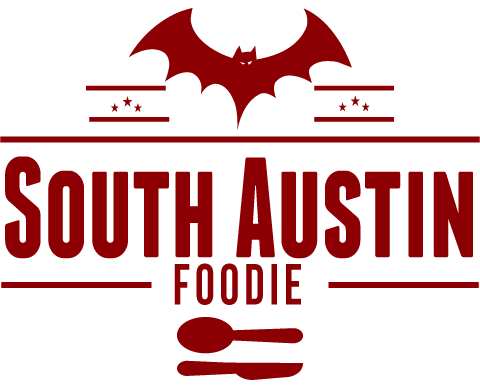 You can smoke ANYTHING in them -- fish, red peppers, meat, cheese... you name it! You can kinda tell from the picture below, it's a metal box with a drip pan in the bottom, and a rack on top. You place your wood chips beneath the drip pan, close up the box, and light it up! 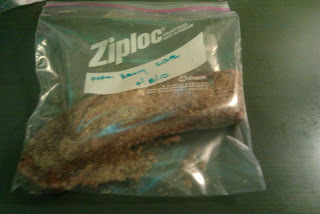 And in my excitement to start smoking it, I forgot to take a picture of it on Sunday evening when it was done curing. It gave off about a quarter cup of liquid, which it's supposed to do (salt extracts liquid, remember?). So I rinsed it off and patted it dry, and let it sit on the counter for about 30 minutes. 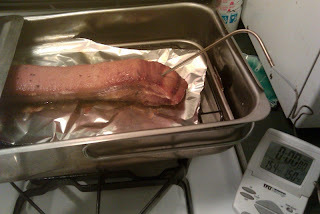 I knew from my research, the internal temp of the belly needed to reach 150 degrees. So with the probe thermometer inserted, and it's control set to 150, I set up the smoker, closed the lid, and turned on the gas burner on my stove to a medium-low temp. Thirty-five minutes later, it was beeping and ready! I was sort of surprised it was done that fast, but the thermometer doesn't lie! So it went onto a cutting board to cool down. About 20 anxious minutes later (it really didn't need all that time to cool down, but I just wanted to be sure), I was slicing it for BACON! 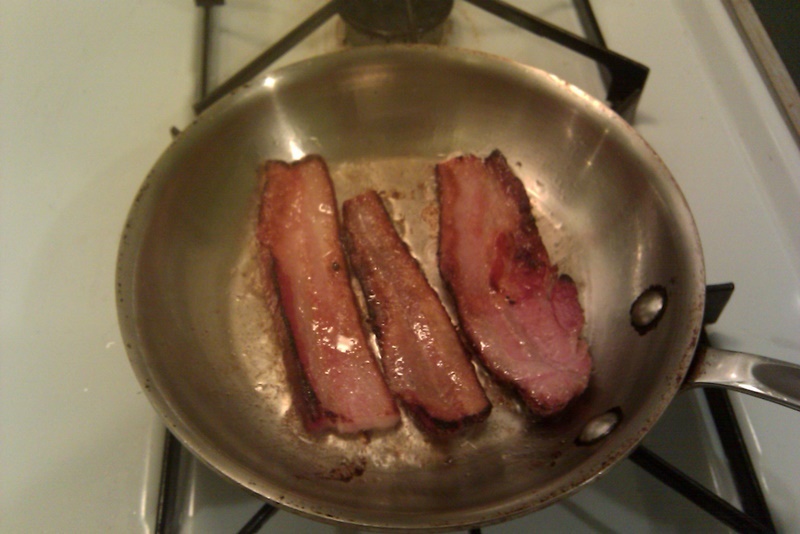 I JUST MADE BACON! Into the frying pan over medium-low heat -- you can't rush greatness! And a few minutes later, I was getting my first tastes of pig-fantastic! 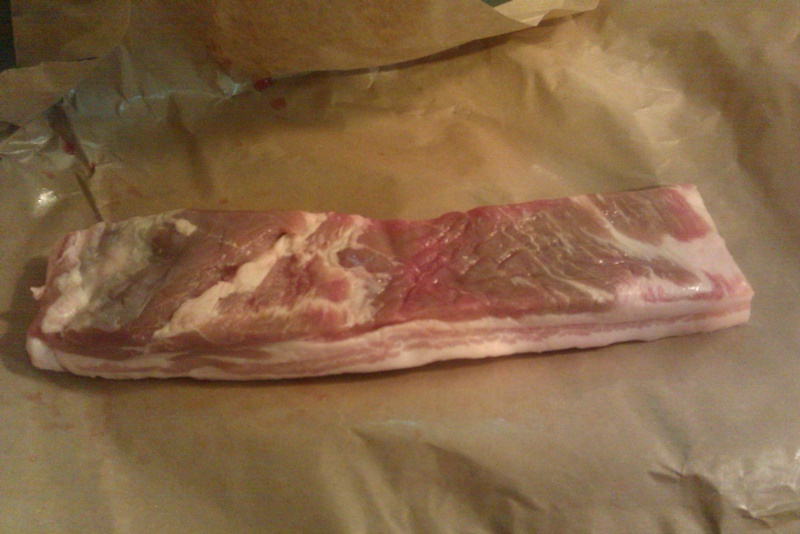 I MADE BACON! IT ACTUALLY WORKED!!! Overall, I am ecstatic! Very pleased with the flavor, though I don't know that I am 100% sold on the flavors of the cure. I took some to my peanut gallery foodie friends this afternoon, and everyone loved it, and thought the cure was fine, not too sweet with balanced flavors. (Thanks, ya'll!) Might try a brown sugar and cayenne next time. Because there WILL BE a next time! And a time after that! In regards to the actual smoking, I used about 3 tablespoons of the applewood chips; I think 2 T. would have been enough for this size piece. Also, future batches should probably be smoked outside on the back porch, using a portable butane stove...a day later, my kitchen still has a lingering smoke scent. Anyone reading this ever try this? Any suggestions for a great cure? I am open to them! Very excited about it, and it really was pretty darn easy! I WILL be doing this again! Soon! All hail the very tasty pig! You make it sound so easy! I need to get a meat thermometer and buy or borrow a smoker, but...damn, I think even I could do that! And the finished product sure looks delicious! We cure our own pancetta and you could use that same cure. 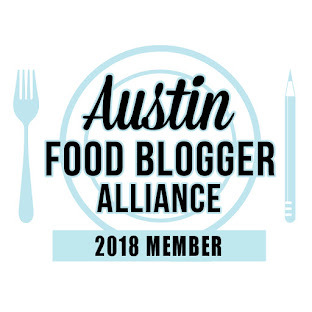 BTW--I would recommend buying your pork belly from Richardson Farms (located at the Barton Creek Mall Farmers' Market on Saturdays). Their meat is very high quality, which will make your end product much more flavorful. Thanks Nicole! I do love the Richardson Farms products, I just can't always get to the farmer's markets on weekends because of my work schedule. 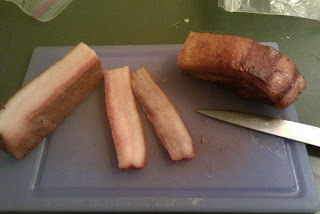 Your pancetta project looked fabulous! Which cure did you like better?